Recently, Facebook has made a change for fan/brand pages and page managers can no longer change the images, headlines, and excerpts show when including a link in a post. Instead, they rely on open graph tags. For those people that manage College and University pages, this is especially frustrating. 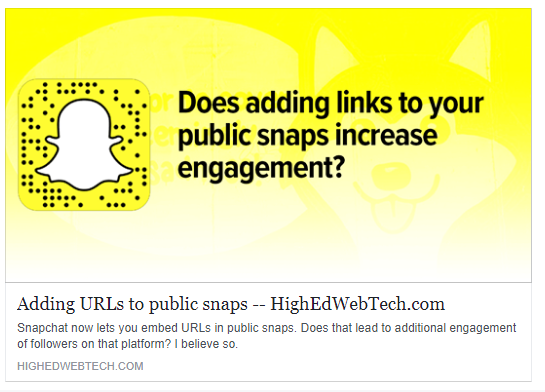 Most of the time we are sharing links, it is to pages that we control and linking somewhere in our school’s network of websites. Even then, we can’t be sure people have correctly tagged their pages. This is important because having clear, interesting copy and images on your posts not only affects us when we share our own content, other people share our content too. We want to make sure our content looks great when shown to others as well! You can set these open graph tags manually in your code. If you use WordPress, most of the SEO plugins including Yoast will set these tags for you and allow you to customize content for them. One area where this gets tricky is with the featured image. Unless you specify a particular image in your code, the WordPress tools like Yoast use the default image you set in the plugin’s settings. Use images that are at least 1200 x 630 pixels for the best display on high resolution devices. At the minimum, you should use images that are 600 x 315 pixels to display link page posts with larger images. Images can be up to 8MB in size. Once you’ve got all your open graph tags ready, it’s time to test. Don’t wait to check until you’re ready to post your story or tweet that, um, tweet. 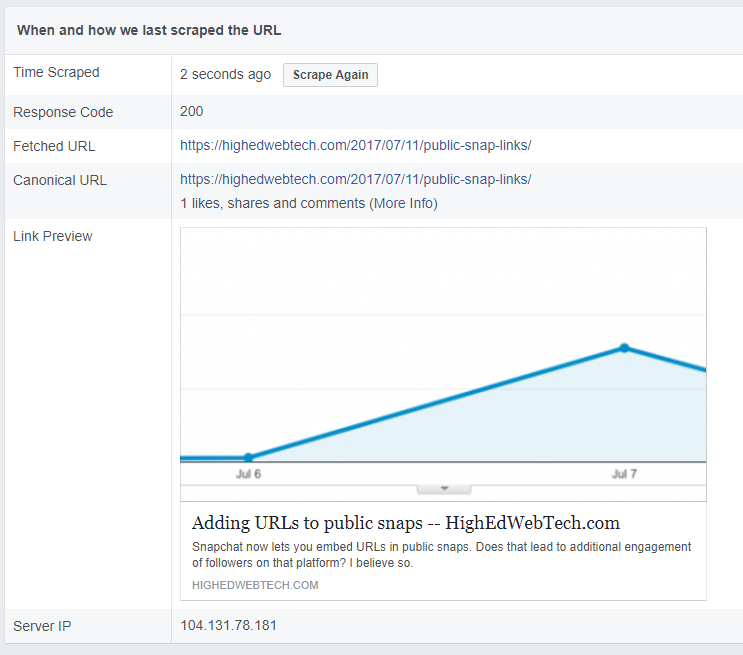 Facebook has a handy debugging tools that will show you what it sees when it scrapes your page and shares it. When you enter a URL into Facebook’s sharing debugger, you get this back. These are the results for a previous post on this blog about Snapchat. As you can see, it has a good post title and the correct description. I’m not crazy about that image, though. It’s just grabbed one from the post to share, as I don’t have a default image setup for this blog. Yes, that’s an ugly graphic, but I only spent 2 minutes on it. Now, Facebook sees the graphic I intended as opposed to a random image Yoast and/or Facebook selected or my default image. It was a holiday weekend here in the USA, so many people were sharing photos and videos of their parties, fireworks, kids, and more on Facebook, Instagram, and Snapchat. I was no exception, throwing up some firework slo-mo videos and a few shots from my Phantom 3. I was posting and liking content on both my phone and laptop, on mobile and wi-fi, in two states and 3 cities. It was all fine until I went to add a new friend. Somewhere in a Facebook data center, an alert was probably set off and I was temporarily banned from Facebook. This is first time this has happened since I created my account in 2005 – you know, back when you had to have a college email address to join. Yes, blocked from using Facebook. They said I had “suspicious activity,” and I could not log in. People who tried to visit my profile got a 404. I found a selfie I took this weekend and uploaded it. And waited. There was no feedback from Facebook on why I had been locked out, possible causes, or the timeline for having the photo I uploaded reviewed and my account unlocked. enjoy your vacation from fbook! A few hours later, I attempted to login again and was allowed in with no issues. I never received any feedback or email messages from Facebook telling me my account was reinstated or saying why I had been locked out. I’m not mad at Facebook. Their systems saw something out of the ordinary, such as multiple logins from multiple devices in several locations, and followed security protocols as developed. My concern is with the lack of communication and method they offered to unlock my account. I don’t know why I was not emailed at any point during the process. Facebook is quick to email me when a friend tags me in a comment or post, or when a friend goes live on video, so it’s strange they would be silent during a major account issue. Second, I think the method of uploading a photo doesn’t seem terribly secure and easy to spoof. 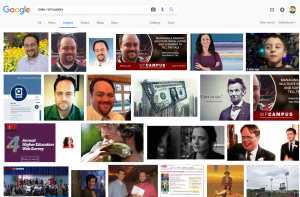 There are photos of me all over the internet, and as you can see, when you google me, there’s plenty of photos. Facebook collects my email and mobile number, I’m not sure why they didn’t make me verify by code sent via email or text, like many other services do. Did a person check the image, or was some super-secret Skynet AI responsible for seeing it was me in the photo and unlocking my account? Was the image actually deleted from Facebook’s servers once the check was complete as they said it would be? Regardless, once I was back in I made sure to check what apps had access to my account (not many) and what privileges they had to access my data (not much). I don’t think one of them triggered the block, but it’s better to be safe with third party websites you give access to your Facebook account. If you do those quizzes and content generators that post on your behalf, you have given those random apps full access to your info, your friends, and more. That gives me a bad feeling, but that’s a post for another day. If there’s a lesson here to be learned, it’s keep a photo of yourself handy in case you need to upload it to Facebook.